All three versions of the new Ford Escape will be available at launch, but don't expect to see many base non-turbo fours on dealer lots. It's a model intended primarily for fleet sales. After eleven years, a change-up: the 2013 Ford Escape drops the faux-SUV pitch and reels off authentically athletic looks and performance. The Ford Escape keeps a familiar nameplate, but it's a completely different vehicle for the 2013 model year—powering away from its boxy SUV-influenced past with potent engines sleek crossover looks, and more interior space than before. 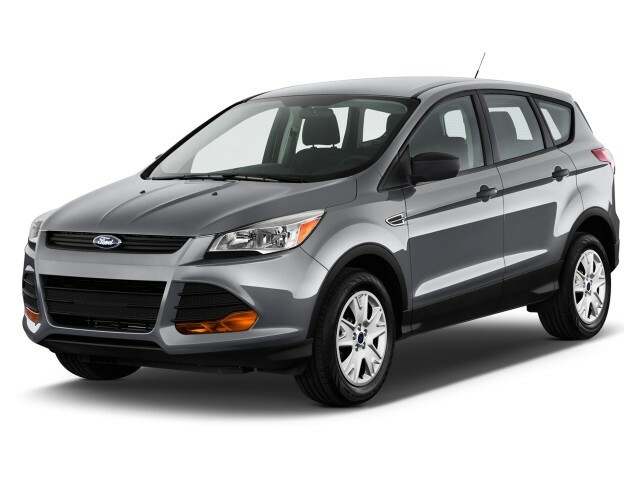 Completely new, derived from the family of components that brought you TheCarConnection's Best Car To Buy 2012, the Ford Focus, the new Escape delivers something very nearly unimaginable, given its heritage--an athletic look that's authenticated by deft road manners. In escaping its own past, Ford's compact crossover turns first to a trio of four-cylinders to replace its former four- and six-cylinder engines and the much-loved but discontinued Ford Escape Hybrid. 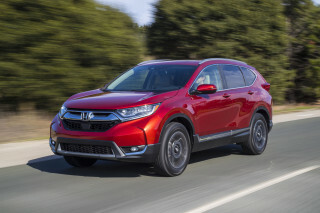 The base engine's a carryover 2.5-liter four meant for fleets, while the mainstream choice is a 178-horsepower, 1.6-liter turbo four with straight-line acceleration competitive with its chief rivals, the Honda CR-V and four-cylinder Toyota RAV4. At the peak of power is a 2.0-liter turbo four with 240 hp, estimated at 0-60 mph in under 8.0 seconds. All versions come with a six-speed automatic; all are estimated at more than 30 mpg in highway fuel economy. On the Escape Titanium we drove, ride and handling were the ideal counterparts for the turbo's dartlike power; we can't think of a single compact crossover that steers with more precision or tamps down ride motions as smartly as the Escape, except maybe the 155-hp Mazda CX-5. The performance pairs well with the Escape's new track suit. The running-shoe styling only wears thin at the front, where the skinny grille and gaping air inlets need to find some common ground and call a truce. The cockpit has its fair share of grey glossy plastic and tangential styling themes; on the balance, it's exciting, not chaotic. The Escape's larger than before, but passenger space isn't changed much. An inch of room in front is now granted to the folks in back. The seats are slimmed down and firmed up, which may not be everyone's taste; we're in their camp, fans of the long-distance support they offer. The cargo hold's larger, and the back seat folds and flips down its own headrests for better storage space--and the new hands-free tailgate option opens and closes the hatch at the swing of a foot. Other available features include an improved but still complex MyFord Touch; a navigation system; HD and satellite radio; Bluetooth with audio streaming; pushbutton start; leather seating; all-wheel drive, with or without a 3,500-pound-rated towing package; and a panoramic sunroof. With Top Safety Pick status from the Insurance Institute for Highway Safety (IIHS), as well as four-star overall ratings (with five stars for side impact) from the federal government, the 2013 Escape has impressive safety--although it's not quite class-leading, if you read directly from test results. Although the Escape's 'poor' rating in the IIHS small overlap frontal test is a sore point. The Honda CR-V, for instance, manages Top Safety Pick status plus five-star federal results and better IIHS small overlap results. Prices range from $23,295 for the Escape S to $31,195 for the Escape Titanium. 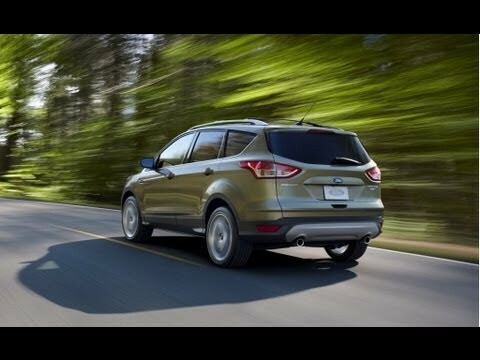 In that respect, the 2013 Ford Escape isn't all that different from the model that came before it. In every other way, it's an Escape in name only--for all the right reasons. With dynamic looks that ditch its past, the 2013 Escape crosses over far from its former SUV-lookalike territory. We golf-clap--while we wonder if some shoppers will be lost without the old ersatz-Explorer looks. From 2001 to 2012, you'll remember, the Escape did its best impression of the first-generation Explorer, down to the grille and window shapes and even the outdated graining of its interior plastics. That's all gone now, replaced by a tightly fitted form that's part hatchback, part running shoe. There's even a bit of the long-nose proportions of a good sports sedan, and enough of the upturned D-pillar to keep the family relationship to the Focus intact. Mostly it's dynamic--though as with the same pieces on the Focus, the mail-slot-sized grille still isn't working for us, and the gaping, buttressed front end is starting to remind us of a dust ruffle pulled up during a dust-bunny hunt. The Escape now looks the part of a modern crossover from the outside--with lots of passing resemblances to the new Hyundai Santa Fe Sport--and it rings even more truly modern inside. The cabin's lost the open, airy feel of the first-generation Escape, and the raked form and safety needs of the day mean the pillars are thickly built too--as is the dash itself, which looms larger than in some similarly sized crossovers. The cut-tube gauges occupy their own nacelle; the audio and climate controls nest in the center stack with a piano-style set of controls and tall, skinny air vents. Oddly, there's another horizontal air vent beneath the LCD screen that seems to exist to cool the climate controls and knee caps. A wide ribbon of high-gloss grey plastic, like the mixed-emotion stuff found in the Chevy Volt, loops around these controls. At the top of this Matterhorn of modernity, ironically, is a CD slot--the one relic of the past decade we can spot inside the new Escape from a dozen feet away. Taut handling and quick steering work well with the 240-hp turbo four; the Escape is one of the best-handling crossovers in its class. How can fuel economy be so close, and horsepower be so very far apart? Don't ask us--ask the 2013 Ford Escape, which puts almost a 75-hp spread between the base versions and the top turbo models, while both check in with similar EPA-estimated fuel economy. 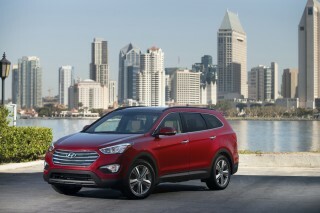 The 2013 Escape initially will be offered in four trim levels. The base Escape S is the only model to offer the carryover 2.5-liter four-cylinder, coupled to the same six-speed automatic found in all other 2013 Escapes, and fitted only with front-wheel drive. 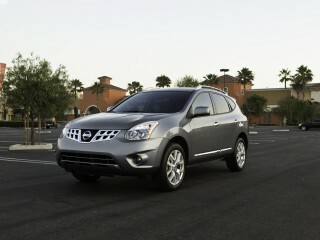 In this configuration, the crossover nets 168 horsepower and 170 pound-feet of torque, and an EPA-estimated 22/31 mpg. Even this base engine outsteams the 155-hp 2013 Mazda CX-5, and comes close to outpacing the current Honda CR-V. Only 10 percent of Escapes will come with this engine--primarily fleet vehicles--and Ford didn't provide a test vehicle outfitted with this drivetrain on its press event. A 1.6-liter turbocharged "EcoBoost" four-cylinder with direct injection is standard in the Escape SE and SEL. It spools up 178 horsepower and 184 lb-ft of torque. While performance is close to that of the base four, the turbo's gas mileage of 24/33 mpg trounces the non-turbo four, and matches that of the smaller Hyundai Tucson and Kia Sportage, while outpacing the Honda CR-V's 22/30 mpg. The Mazda CX-5, at 26/35 mpg for front-drive versions, is a gas-mileage leader--but as we've seen, performance from its 155-hp four is lacking, which isn't so much the case with the Escape's 178-hp four, and its estimated 0-60 mph times of 8.5 seconds. The Escape's top option is the 2.0-liter EcoBoost turbo four, which puts out 240 hp and 270 lb-ft of torque. Like Kia's Sportage SX, it's a quick, dartlike performer, with the clabbering noise of a turbo four a more distant roar here than it is than in, say, the Range Rover Evoque. 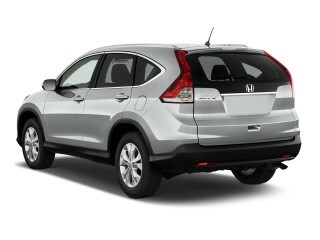 It delivers 22/30 mpg and performance that's much stronger than the Honda CR-V--an estimated 8 seconds or less to 60 mph. 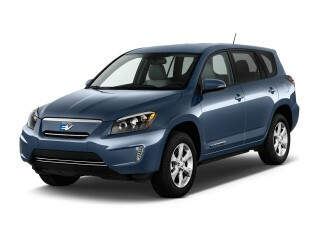 All Escapes shift power to the front or all four wheels via a six-speed automatic transmission. It's mated well to the turbo engines, and the shift points strike a good balance between straight-line acceleration and gas mileage. They have to, since at 3,500 to 3,700 pounds, the Escape weighs a couple hundred pounds more than its Honda and Mazda competition. The one annoyance is the lack of shift paddles--instead, the Escape turbos get a +/- rocker switch on the shift lever and a sport-shift mode that, by their very location, do nothing to encourage sporty driving. Front-wheel drive's the norm for the new Escape. A new layer of cornering sophistication comes with torque vectoring, which uses anti-lock braking to clamp an inside front wheel to tighten corners when slip is detected. We rarely recommend all-wheel drive (AWD) in the crossover class, since the benefits usually don't outweigh the added heft. In the Escape's case, the relatively simple AWD setup splits power between the front and rear wheels to shift power up to 100 percent to the end that still has a grip. Word to the wise: unless you live in the northern tier or at elevation, skip the extra hundreds of pounds and dollars and put them toward the payoff. In chunky, almost fully optioned Titanium trim, our Escape took us on a 150-mile tour of the Marin Headlands that left us convinced of its complete break with the past. The ride and handling are proof enough that this Escape's almost worthy of a new nameplate. The trucky motions of the prior version are wiped clean. This really does feel like a Focus grown up and out, with a tightly damped ride, and weighty, fast steering that's not too overly blessed with feedback. It can feel too tautly strung at times, since the seats are no longer thickly padded, the Titanium's wheels and tires are big 19-inchers, and since there's almost no body flex to absorb ride impacts in the way the old Escape's doddering body structure used to soak up those things. In the balance, the new Escape's road manners are a huge departure--in precisely the right direction. The Escape has more interior space than before, but the seats are firmer, and it's still down on volume to the CR-V. It's grown in overall length, wheelbase, and in cargo space, and the interior feels much more carlike, too. The 2013 Ford Escape doesn't net much more usable room for passengers, though, which leaves it quite comfortable, if a bit less open and airy, than the benchmark Honda CR-V. This year's edition of the Escape checks in at 178.1 inches overall, with a 105.9-inch wheelbase. That's up 3.4 inches in length and 2.8 inches in wheelbase--and against the just-refreshed CR-V, it's marginally shorter, but has a wheelbase 2.8 inches longer. Versus some other new and noteworthy competitors, the new Escape's roughly the size of the upcoming 2013 Hyundai Santa Fe Sport, and not much larger than Hyundai's Tucson. That additional wheelbase shifts some space around inside the Escape from the prior version, moving a little more than an inch of leg room from the front seats to the rear seats. It still nets less in this vital spec than the current Honda CR-V: the Escape's 40.4 inches of front leg room measure up against the CR-V's 41.3 inches, and in back, the Escape's 36.8 inches of space line up against the Honda's 38.3 inches. It's still spacious enough to outpace smaller crossovers like the Tucson, Sportage and Rogue, more so in the back seats than in the front. In front, the dash structure tends to nibble away at knee room in the front seats, and in the front passenger seat, the footwells taper narrowly between the dash and the wheel well. The CR-V has more space here, and its seats are more thickly upholstered. Sitting on the Escape's back bench, knee room is no problem, and two adults will find ample comfort. Headroom is exceptional front or back, without the panoramic sunroof. We like the Escape Titanium's very firm leather seats, which wouldn't feel out of place in a sport sedan. From the side, they have a very slim profile, and clearly were engineered to preserve as much passenger space as possible. Still, some passengers may just think they're too hard. While the driver can option up to 10-way passenger seats, the front passenger seat is manual-adjust only, even on Titanium models. The rear bench seatbacks recline for a comfortable long-distance riding position. The rear seats also split and fold, with a clever mechanism that requires just a tug of a fabric loop to flip down the headrests and allow the seats to fold flat. The CR-V's rear bench goes a step further, with a lever that flips up the bottom cushions and tucks the headrests, making the best use of every cubic foot of its cargo hold--which at 70.9 cubic feet, nips the Escape's 68.1-cubic-foot hold by a slim margin. What we appreciate about the new Escape's cargo area--aside from an optional two-position load floor that gives a choice between a flat floor and maximum storage space--is its regular shape. The enclosed cargo bin has grown taller and squarer, which means 34.3 cubic feet of unattended bags and goodies can fit inside, under sheetmetal and cargo cover. Conversely, it's not as pet-friendly as before, since the tall sides and smaller glass areas won't give any view to animals riding in crates in back. 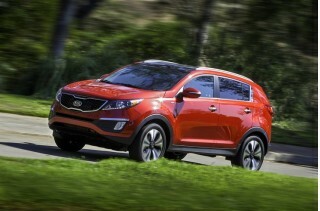 With an all-new structure and good safety ratings, plus some new safety technology, the new Escape is a secure pick. The Escape is new from the ground up for the 2013 model year, and its safety ratings reflect the better protection that's inherent in its all-new body structure. With Top Safety Pick status from the Insurance Institute for Highway Safety (IIHS), as well as four-star overall ratings (with five stars for side impact) from the federal government, the 2013 Escape has mostly impressive--although not quite class-leading--safety, if you read directly from test results. Although the Escape's 'poor' rating in the IIHS small overlap frontal test is a sore point, for sure. The Honda CR-V, for instance, manages Top Safety Pick status plus five-star federal results and better results in the small overlap test. That said, the Escape covers all the safety bases. Standard features include dual front, side, and curtain airbags; anti-lock brakes, traction and stability control; and Ford's MyKey system, which lets drivers place limits on speed, volume, and other functions, for younger drivers. Standard curve control limits power to all four wheels to help the Escape stay on a safer path if the driver approaches a corner too quickly. The new Escape has some of the more extensive safety options in the class, starting with front and rear parking sensors and a rearview camera. From there, it can be outfitted with blind-spot monitors with cross-traffic alerts. The Escape's electric power steering also makes active park assist possible. As on some other Fords, this system judges parallel-parking spots, and steers the Escape into them when it will fit, with the driver operating the pedals. The Escape has optional all-wheel drive, and with the towing package, it comes with HID headlamps and trailer-sway control, which uses stability control to compensate for the rocking motion induced by a trailer. MyFord Touch is improved; leather, a panoramic sunroof, and Sony sound lift the Escape into the near-luxury leagues. It may be a mild shock to realize the Ford Escape's base price now sits in the mid-$20,000 range, and that it's possible to spend nearly $38,000 on a fully loaded model--when a base Land Rover Range Rover Evoque starts at just under $45,000. However, even the base 2013 Escape S has standard equipment that wasn't even on the radar when the crossover first emerged back in 2001--features like a USB port for media player connectivity. The base Escape S, at $23,295, also comes with air conditioning; an AM/FM/CD player with six speakers; an auxiliary jack; power windows; cloth seats; and the 2.5-liter four-cylinder and the six-speed automatic. The Escape SE, at $25,895, adds on standard satellite radio; 17-inch wheels; keypad entry on the door frame; and Ford's Bluetooth-driven SYNC controller, which uses voice commands to run phone and audio systems, with information displayed on a 4.0-inch color screen. For $28,695, the Escape SEL ventures deeply into luxury territory with leather seating and heated front seats; ambient lighting; and dual-zone climate control. It also implants a media hub in the center console, bundling two USB ports, a set of RCA jacks for gaming systems, and an SD card slot for music or data. The SEL also gets the latest version of MyFord Touch, the touchscreen-and-voice system that Ford's introduced in the past two years to take over operations of many secondary systems, including the Escape's available navigation system, as well as SYNC-driven phone and audio systems. We do think it's cleaner and easier to navigate now, though it's still five or six voice commands to find a simple hotel listing in San Francisco. We did notice that the Escape has a volume knob and a simpler climate-control interface with knobs and buttons--whereas, first-gen MyFord Touch crossovers like the Ford Edge and Lincoln MKX had swipe-sensitive strips for those functions that rarely responded quickly or evenly to the touch. Here's to improvement--and to the same small steps of retreat we've seen at BMW with iDrive and at Audi, with MMI. 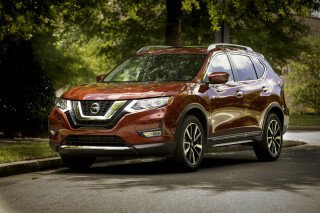 Opt into the most expensive $31,195 Escape Titanium and you get the 240-hp four standard, along with more luxury features--heated mirrors, 19-inch wheels, pushbutton start, and fog lamps. You'll also get a hands-free tailgate, which lets you wave a foot under the bumper to open or close the tailgate automatically. 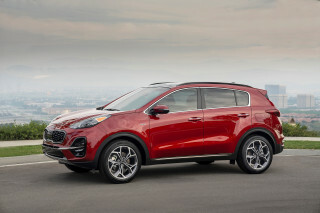 Major options on various Escape models include a panoramic sunroof; pushbutton start; navigation system; Sony sound system; HD radio; remote start; hands-free liftgate; active park assist; 18-inch wheels; a towing package; and of course, the more powerful EcoBoost engine and all-wheel drive. Some Escapes will hit EPA-rated highway mileage in the 30s; we've observed low 20s on the sportiest model. The 2013 Ford Escape hits the market this spring with the best estimated fuel economy numbers in the compact crossover class--they're as much as 5 mpg better than previous Escape, and in a tight race with some crossovers that sit a half-size smaller. Ford credits lots of engineering sweat equity for the Escape's 25-percent fuel-economy improvement. The smaller-displacement, turbocharged engines sport direct injection, and the Escape is almost 10 percent more aerodynamically sleek than the 2001-2012 model. The new Escape also gets active aero shutters on all but the 2.0-liter versions; the shutters close at highway speeds to smooth airflow over the grille, cutting wind resistance and as a result, boosting fuel economy. With the base 2.5-liter four-cylinder, Ford estimates fuel economy will be rated by the EPA at 22 miles per gallon city, 31 miles per gallon highway. It's offered only with an automatic transmission, as are the other powerplants, but it's not offered with all-wheel drive. Both of the turbocharged four-cylinders can be fitted with all-wheel drive, which may drop estimated fuel economy numbers provided by Ford. The smaller 1.6-liter turbocharged four-cylinder is pegged at 23/33 mpg, again with the six-speed automatic transmission--it's the best-ever numbers for the Escape lineup, save for the now-discontinued Hybrid model, and tied with the ratings for the smaller Hyundai Tucson. The most powerful model, the 2.0-liter turbo four, is listed at 22/30 mpg. It's effectively a replacement for the old V-6 engine option, and handily outpaces that powerplant's 19/25-mpg EPA rating. All-wheel drive lowers combined fuel economy by 1 mpg in both cases where it's offered. In our 150-mile test drive of this model, we saw an indicated 20.8 mpg, over roads that ranged from wide, sweeping two-laners, to six-lane interstates, to rugged two-laners through national parks. Our heavily optioned vehicle had all-wheel drive, but not the panoramic sunroof; carried two adult passengers; and had more than the usual break-in mileage. We'll report back when we've experienced other powertrains, and observed more fuel-economy runs in the new Escape, before we judge whether the EPA figures are overly optimistic. I purchased this car used from Auto Nation Ford in Scottsdale, and I should have taken the situation as a red flag. The original owners put on all the upgrades and it really is a great looking, comfortable... I purchased this car used from Auto Nation Ford in Scottsdale, and I should have taken the situation as a red flag. The original owners put on all the upgrades and it really is a great looking, comfortable car. So why did they return it so soon? Shortly after purchasing (immediately) things started going downhill. The car was constantly running out of coolant (it was winter in Arizona). After some research, I learned many people have had this issue and it has something to do with the engine and turbo not agreeing (I am not an expert, don't quote me!). It results in the coolant line leaking until eventually (surprise!) you have holes and the possibility of your entire engine catching on fire. I made note of this to the dealership, which they shrugged off and insisted this was unrelated. Fast forward 2 years, lots of burning through coolant, and some AAA calls later when the car would just shut down, I had to pay $600 to have the issue repaired. Mind you, this is the same issue I expressed my worry to Ford about, and they shrugged off. The Ford repair shop would not let me refuse the service either, because my car was now UNSAFE to drive and, "about to catch on fire"- actual quote. Never mind the endless recalls as others here have mentioned. Door latches just randomly stop working...wtf? This car is truly a LEMON and Ford should be buying these death traps back. I will never purchase a Ford again. Oh, and want to change your battery? You'll have to know how to dissemble and re-assemble the entire front of your car. Worth noting. Every service takes anywhere from 24 hours to 2 weeks. Parts are never in stock (likely from everyone's cars always breaking down). I do like my escape but now I'm finding some hidden malfunctions like electrical steering wheel and is not cover by insurance and is costly to fix my is 89000 kilometers and stop working and Ford company will... I do like my escape but now I'm finding some hidden malfunctions like electrical steering wheel and is not cover by insurance and is costly to fix my is 89000 kilometers and stop working and Ford company will not recalled them up to now. To fix it is about $2,800 dollars. I know I'm not the only one but Ford is not dealing with this problem i guess until somebody get hurt. Optional 2.0L Ecoboost, entertaining ride. Good, entertaining car..power, handling, and comfort very good. Gas mileage acceptable. Selling dealer 1st rate and service above and beyond. Love everything about this vehicle! Bought mine used but love all that it offers. Excellentc gas mileage. Looks great, runs great, economical, priced right. Great car for those who are downsizing from a van. Only item that I would have liked to see changed is a larger gas tank.